I wish I could bundle it up. I wish I could gift the entire world the words I heard last night. I wish I could take all the words I heard last night as I sat in the auditorium at George Washington University listening to Brene Brown speak about belonging and sprinkle them on every single person. We need her work and her words. I need her work and her words. It all made sense. As she spoke, I understood the sadness, the fear, the loneliness that has manifested itself into hatred in our world. It doesn’t matter who you voted for or what religion you practice (or don’t) when we look at this humanitarian crisis we are facing. We’ve forgot we are human. We’ve forgot we are all connected. We’ve forgot that degrading one woman, dehumanizes them all. We’ve forgot hundreds of years of history where we dehumanized people because of the color of their skin. We have to rehumanize ourselves. We have to rehumanize each other. For 90 minutes Brene spoke about her work, her new book, and the current climate of our country. It all made sense. We have forgotten we are all human. The evening ended with an auditorium filled with 1500 people and not one single empty seat joining together in a moment of collective happiness. Through music we united. We sang. It was silly and awkward and joyful. Together we shared joy. Music and Brene’s brilliant work gave us this. This morning after getting home sometime in the early morning hours, my 13 year old woke me up to tell me there had been another shooting at a concert. 50 were dead. Hundreds were hurt. They came together for collective happiness, and this happened. I asked him to turn off the tv. I feel asleep filled with hope. I feel asleep understanding how we got here, and a small glimmer of hope of how to move closer to being human again. Waking up to another attack of terror (because that’s exactly what this is) made it all confusing once again. How did we get here? I haven’t turned the news back on. I don’t need to. I can feel it. I can feel the sadness in my heart and in my head. It’s lingering in all the spaces that surround me. We’ve forgotten we are all connected. A mother grieving for her child is felt by every mother. It’s up to us to acknowledge it. In those 90 minutes that Brene spoke last night, I heard clarity in so many of our issues. My brain is scrambling to piece them all together so I can logically take the next step forward. While my head scrambles to find facts and reason, my heart aches for no reason other than there is a lot of sadness around us. There is a lot of hate. There is a lot of fear. As I walked to my car last night, I said to my friend I wish I could ask Brene one question. I wanted to ask her what do I do now. As a member in the audience who sought out her research, what do I do now? How do I move it forward? Today I saw her answer as I opened my eyes. It’s my children. It’s the people I touch. It’s my reach. Tonight, instead of watching the nightly news, I asked Cole how he felt about the shooting. I asked him how he felt about kneeling during the national anthem. I asked him if he had friends at school who were transgendered or gay. He awkwardly answered while I patiently waited. The more he talked the more his awkwardness disappeared. I listened until he asked me what I thought too. 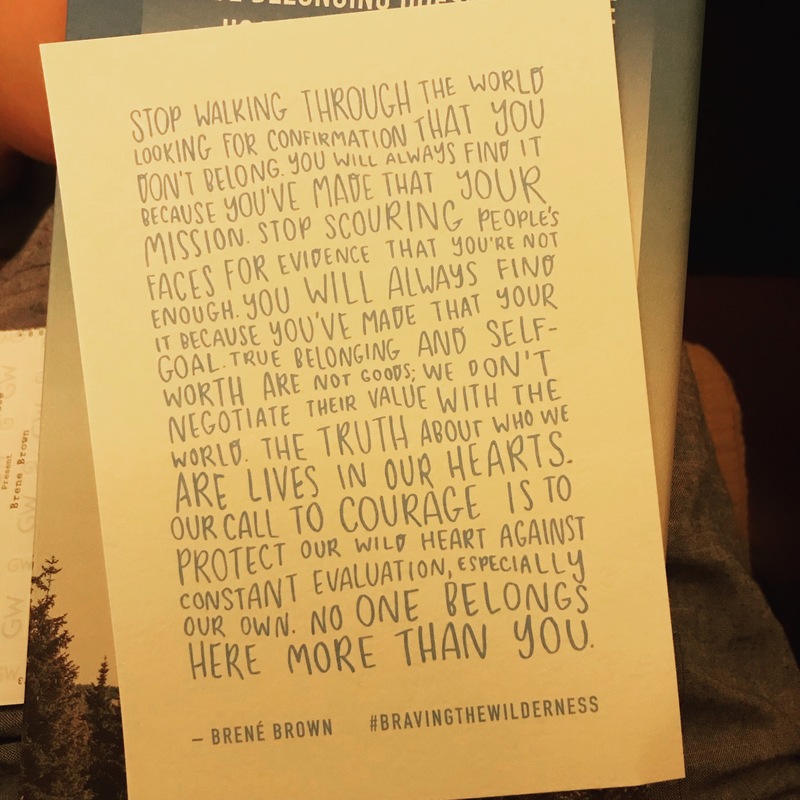 Thanks to last night and the amazing research of Brene Brown, I could easily articulate my answer. I believe we all want to talk long enough until our awkwardness disappears. We want to protest or fight back until we are rehumanized. We want to be seen. I kissed my boys good night a few extra times this evening. Maybe just maybe raising them will help bring humanity back to our planet. We have to talk about these things. We have to talk about the hard painful things in life. We have to talk about the things that feel awkward to us because it’s not our normal. We have to reconnect ourselves. We have to share our ugly truth. We have to be human. We have to remember we are all human. Thank you. I will look for her book. Ah. Beautiful. My heart is filled with sadness and beauty. It’s hard to navigate these times. Good to know that there are people out there providing some words to help do this.